I fear what others think about me for my whole life. Only recently, I have started overcoming it and slowly caring less and less about the opinions of others. This article is about where the fear of judgement originates, how it most likely affects your life and what you have to do in order to learn to stop worrying about what others think about you. Plus, you will find in this article a few funny photos and videos and a bonus for the readers of this blog only. Where does the fear of judgement originates? I have no idea why this fear is so powerful in my life. Maybe it’s because of the way how I was raised, or in what environment I grew up. 20 years ago, it was so normal to tell your kids not to do something because of what would the others think. “Put your pants more up, what will the others think.”, “Be nice, what will the others think.”, “You have to go to the church, otherwise the whole village will talk bad about you.” and so on. I am sure you can remember many similar phrases you used to hear from your parents, grandparents or teachers at school. Maybe it’s because talking behind people’s back always has been and still is a national sport in Slovakia. No one wants to be talking badly about and no one wants other people to think bad about them, so we all fear what’s the opinion of others about us. Maybe it’s because of the school system in which I was raised. Our teachers judged us not only based on what we knew, but also (and often especially) for how we acted or what kind of clothes we wore. “Don’t wear that old shirt, what will your teacher think of you.” The same once again. Maybe it’s because kids are often very mean to each other and laughing at each other. Teenagers don’t do it as obviously as kids do, but they do judge others too. And then we are surprised that we grow up as stressed out adults who fear the opinions of others who they may never even met before, and who want to be liked by everybody. It happens many times to me that I want to do something, but I don’t do it only because I have an inner fear of being judged by others. Do you want an example? Okay. I write a new article with a strong opinion and I am worried that my reading will not like it or that they will judge me. I had this fear when I published my article about being weird, for example. Do you want another example? I want to talk to a girl who I like, but I will not do so because she is not alone. I fear that she will reject me and the people around will judge me or laugh at me. Another example? Sure, no problem. I fear cameras and public speaking my whole life. I will most likely talk about this fear in one of the future articles, but the main reason of this fear is the fear of being judged by others. Even though I am around people I have never met before and will most likely never see again (at a beach in one of the most touristy islands in Thailand for example), I still don’t do what I want to do because I fear that others will make fun of me. I remember how two guys – typical bullies – made fun of me in junior high school. It made me very unhappy and since I still remember it now, about 15 years later, I believe this is one of the main reasons why I fear that others will judge me or make fun of me. How do I want to overcome my fear of judgement? Anyway, at the moment, it doesn’t really matter where my fear of judgement came from. What matters is that this fear have been holding me back for too long and that I want to change it. How? I am glad you are asking. I will force myself into situations where others will have a chance to judge me. I understand the theory well. I know that others care the most about themselves and in most cases, they will not even notice. And even if they notice, they will just register you and go right back to what they were doing before, without any hint of judgement. A few months ago, I have watched this TED presentation, where Till argued that laying on the ground for 30 seconds is a great way to become more confident and to stop worrying about what others think about you. Since then, I planned to do something similar, but never really did it. I always found an excuse to not do it this time, but the next time. But recently, Till has come with a challenge which changed my life and inspired this article. The goal of the challenge was to do 4 different activities which were great for boosting your confidence and getting rid of the fear of judgement. Every second day, each of us received an email with a challenge. We had the next 48 hours to do the challenge. By the way, none of us knew what kind of challenges Till would give us. That was the most fun part, but the most scary part too. The first challenge was to go somewhere with lots of people and lay on the ground. Just like that, for no reason and with no explanations. 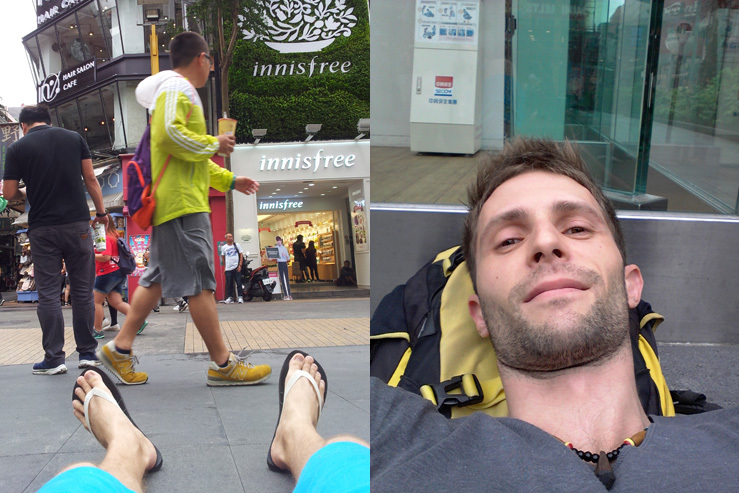 I have decided to do it in one of the most popular areas of Taipei, called Ximen, which is the biggest pedestrian zone in the city and which is popular for it’s many cinemas, shops, food stalls and bars. I was being nervous already while taking the metro. I knew what I was about to do, and that gave me mixed feelings of uncertainty, fear and joy. What I was just about to do was crazy. 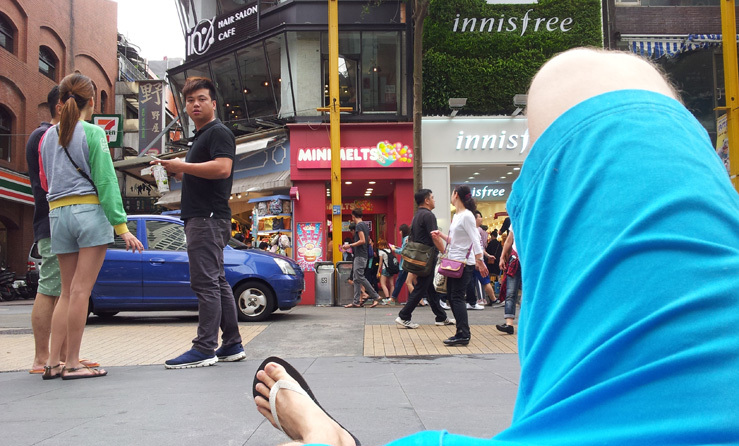 When I arrived in Ximen, which was just getting busy with people, I walked around trying to find a good place to lay down. I couldn’t find some floor which was not dirty or which the cars and scooters didn’t use. 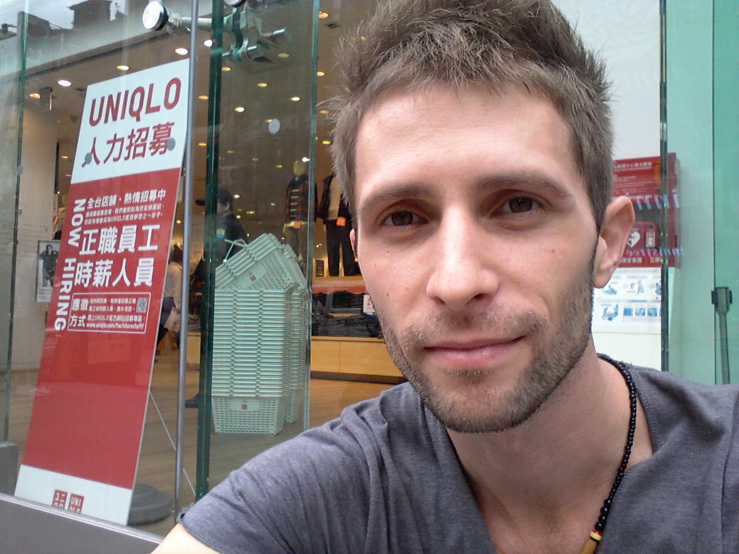 Then I found a good spot just in front of a large shopping mall. But I got scared and found myself an excuse – to try to find a better place. As I said, it was an excuse. I was scared. After a few metres though, I realised that I would not find anything better, so I turned around and went back to the spot where I planned to lay down. I was nervous as hell, but I did it anyway. I layed on the ground. Many people have noticed me and started staring. After a while, I stopped being nervous and I started smiling at people who looked at me. Because of that, many people smiled back. After a short while, a security officer came from inside the shopping mall. He told me I couldn’t be laying down. I kept laying down and talked with him. I told him that I needed some rest and that I couldn’t go on the road because of the cars. He told me that it was dangerous for me to be laying on the sidewalk because people could trip over me or step on me 😀 I asked him to allow me to lay down for 1 more minute, then I would leave. He said no maybe 4 or 5 times, but at the end, he agreed and left. After a minute or so of chilling on the ground and smiling at surprised strangers walking by, I sat up and read for another 10 minutes. Afterwards, I felt great, proud of myself for overcoming my own fear. I went to get a soya latte and, on the way home, decided to do something more. In a half empty train, I decided to sat down on the floor, exactly in the middle, even though there were plenty of empty seats available nearby. Some people looked at me, but most of them totally didn’t care. The first challenge was difficult, but I struggled with this one. The point was to compliment a total stranger in the street. To say something like “I like your jacket. Where did you get it?”. I took me a few days to gain the courage. To say something to a stranger is much more difficult than just doing something (e.g. laying on the ground). Also, it didn’t help that I was in Taiwan, where maybe 95% of people don’t speak English, or if they do, they are very shy to do so. I was looking for “the right person” for the next few day. But that was just my own form of procrastinating. The perfect situation never comes. Good situations come often, but sometimes, it takes just a small moment and the opportunity is gone. I noticed a pretty girl in a shop I was walking by. Then I got red light on the traffic lights. I knew I had at least 90 seconds before I could continue. That’s when I decided to go inside the shop and tell the girl, who worked there, that she looked great. But the girl didn’t speak any English. She didn’t understand even the word “beautiful”. So I took out my mobile phone and translated the phrase into Chinese for her. She smiled and thanked me. I said that that was all I wanted to say, said good bye and left. I am sure that later that day, she told her colleagues or her friends about it. Take a selfie with someone you don’t know. Another tough challenge for me. I was again looking for the right person. I procrastinated. Meanwhile, I was invited to a birthday party of my friend. It was exactly 1 week before Halloween and our friend asked us to bring some Halloween hats for the event. I got an idea. This was a great opportunity for me to get out of my comfort zone again. 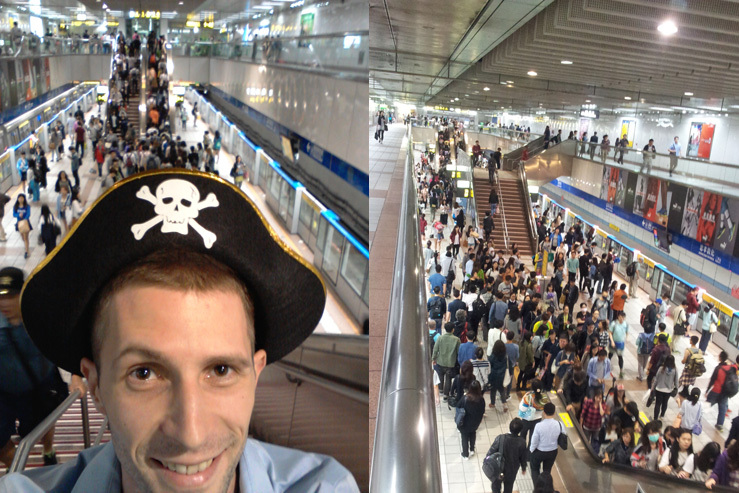 I decided to wear my pirate hat for the whole time from my house to the event’s location. I wore this stupid hat already when I left my house. I had to take 2 metro trains which took me about 30 minutes. 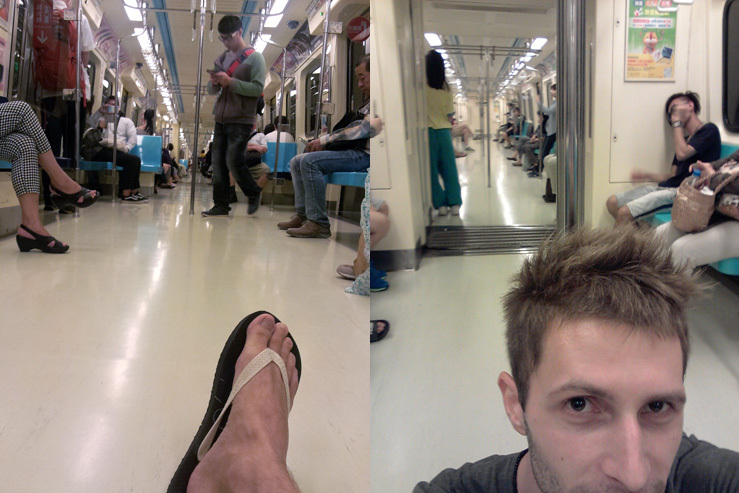 It was Friday evening, time when the Taipei metro is packed. Everyone goes home from the school or work. Since I left the house, everyone kept looking at me. Kids, elderly, almost everyone. 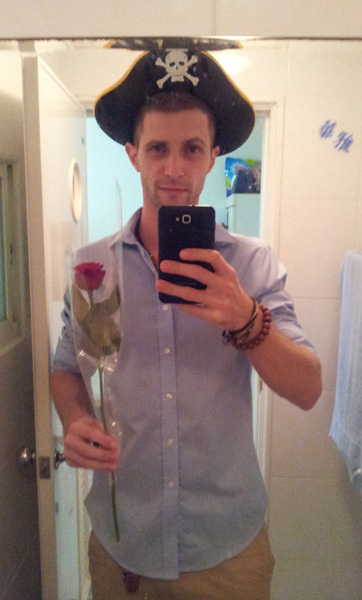 Since I am tall and I am a foreigner here in Taiwan, everyone noticed me easily. In the metro, I kept hitting the handrails what made the whole situation even more awkward. 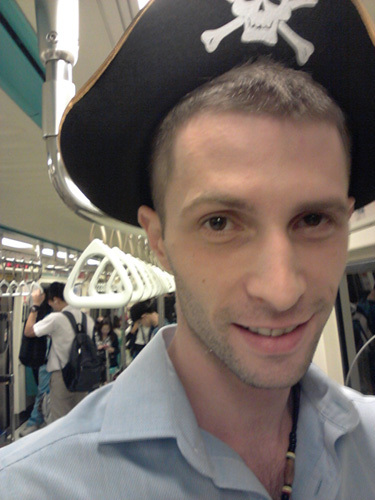 A pirate inside the Taipei metro. The first train was not that full, but the second one was so packed I couldn’t even take a picture without upsetting everyone for taking a picture of them. Inside the train, I noticed one girl, who was taking selfies. After she took at least 6 pictures of herself, I walked to her and asked her to take a selfie together. Her answer was a strong NO. She even shook her head. It was obvious she didn’t want to take a picture in a train full of people, with someone she doesn’t know and who is wearing a pirate hat. After a 30 minute ride, I arrived at the station where I was supposed to meet with my friends. This station was in an area of the city very popular for nightlife. Since it was an early evening, everywhere around me were lots of young people and many gorgeous, dressed up girls. And I was standing there with a pirate hat on my head, looking at others and smiling. Some of their looks were as if they saw a crazy person. I could see that some people felt quite uncomfortable since they saw something unusual. As if it was an error in Matrix, something they didn’t understand and that made them uncertain. But many others smiled. This is how it looked like at the station every time a new train came. Every few minutes, there were hundreds of new people. Then, I smiled at a girl walking by. She smiled back. After a few steps, she stopped, turned back and came to me. With a smile on her face, she asked me if we could take a picture together. I not only got this nice photo, I also got her contact. Maybe I should start wearing pirate hats more often. I had a selfie with a stranger, but I was not the one asking to take the picture, so I was still not satisfied. A few days later, I was waiting for my friend in front of a metro entrance. I kept looking for someone I would take a picture together with. After a few minutes, a couple on a scooter stopped just next to me. They got red on the traffic lights. They looked at me and I looked at them. Then I stood up and walked to them. 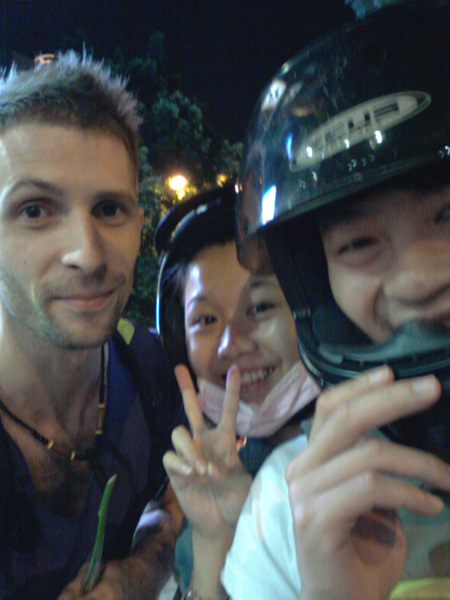 They talked very little English, but at the end, they agreed to take a selfie together. As I was taking out my phone from my pocket, the traffic light turned green, but they were so kind they pulled over to take the picture with me. By the way, exactly when we were taking the picture, my friend, who I was waiting for, came. She then asked me if I knew those people. You should see her reaction when I told her that I didn’t. This challenge is really funny. It was the easiest one for me. Maybe it was because I didn’t have to directly talk to anyone, or maybe because I had already done a few challenges before and I started worrying less about what others thought about me. My friend Michelle helped me to shoot the video. I walked across a main road, again in a popular area of Taipei, while looking into the eyes of people walking towards me and at the tens of scooter drivers waiting at the traffic lights. But the best part is just coming. After we crossed the road, Michelle told me that she overheard two girls talking about me. One of them said to the other one: “That guy is kind of cute, right?” And the other one agreed. This is the last thing I would expect to happen when walking with my hands up in the air. I am already sure that these challenges have changed my life. At the birthday party of my friend, we wrote on a small wooden board “Free hugs here”. When one of the bartenders noticed, I stretched my arms and we hugged. A few minutes later, all 10 of us got a free drink! This is how valuable it is to make someone genuinely smile. A few days ago, I talked to a very pretty girl in the gym. I was so nervous and normally, I wouldn’t do it, but I overcame myself. And you know what? 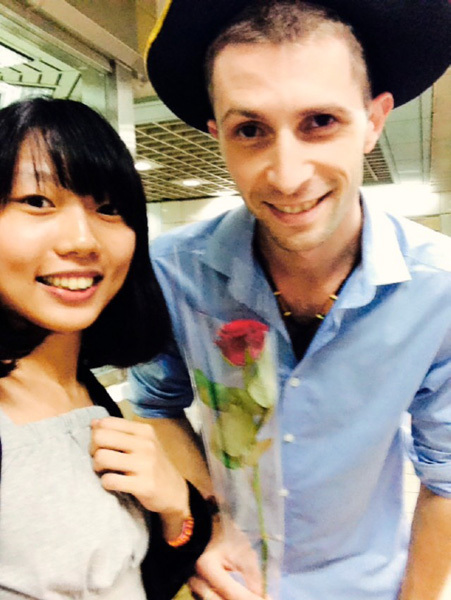 She not only speaks perfect English, but we had a great chat and also exchanged contact details. 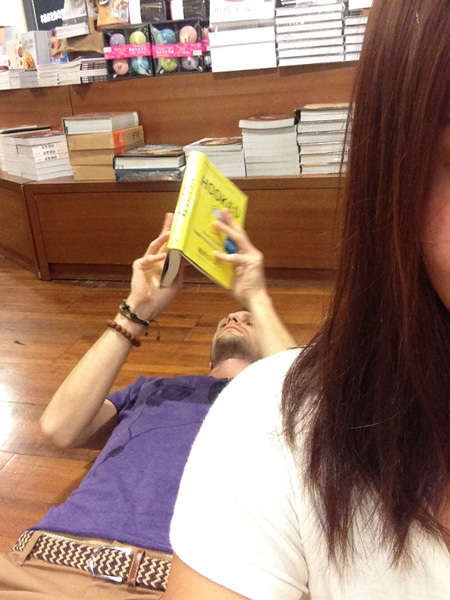 Recently, I layed on the ground for a few minutes in a bookstore, because my back was tired from reading for long time while sitting. I didn’t even realised Michelle took a picture of me, since I was fully focused on the book. When one woman walked by and said out loud “Seriously? !”, I sat down and me and my friend had to laugh. I didn’t care that she didn’t like it. It was just funny to see that this made her upset. The main point of this article is this: Fears and worries take away our happiness. When we don’t do something we want to do, we can’t be happy. To be happy is the right of every single person living on this Earth. Therefore, if you take yourself too seriously and if you care too much about what others think about you, you are limiting yourself. Learn to stop caring about others’ opinions and about what they think of you. Even with the help of these kinds of crazy challenges. We live only once, so let’s make it count! Till has created an online course which helps people to overcome their fears. I have done Till’s 7 day challenge which has for sure helped me to fight my fear of judgement. I believe this course is worth it. That’s why I signed up and can’t wait to start the course myself. I reached out to Till and told him about this article and our community. He was more than happy to offer you guys, my readers, a discount of 34% for his online course Make Yourself Do Anything. If you really want to get rid of your fear of judgement, I believe that there is currently no better resource than this online course.